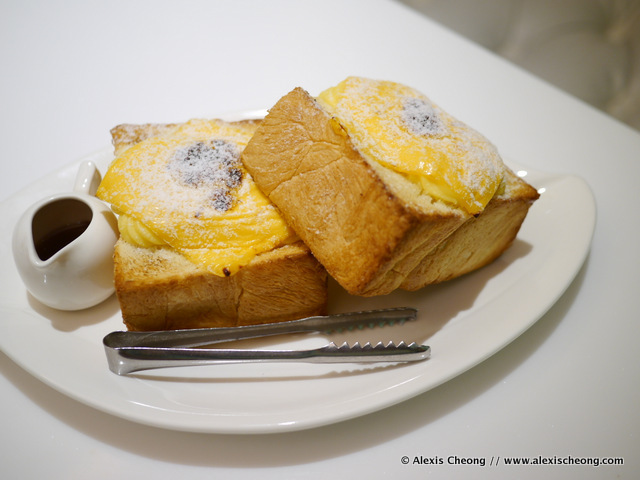 I still remembered how when popular Taiwanese dessert brand Dazzling Cafe first pre-launched in Singapore, I tried to visit it with partner in crime Stooffi on a Saturday afternoon, and was told that the waiting time would be 5 hours. The harried waiter had a double-sided sheet of A4 paper filled with names of those he had to contact when its their turn. Of course we left and had something else. Dazzling Cafe turned out to be very much hyped and long queues were common every day. I was rather turned off by the crowd and hype to be honest, until recently when I had the chance to try it for myself. Good news! Dazzling Cafe is no longer crowded. In fact, it could do with more people on week days. When I went at 4pm on such a day there were about a few others, which made the place a really good spot to have some drinks and a dessert with friends. I have decided to do this tasting, also because I recalled having seen a few recent postings about their food/drinks to be better than launch. 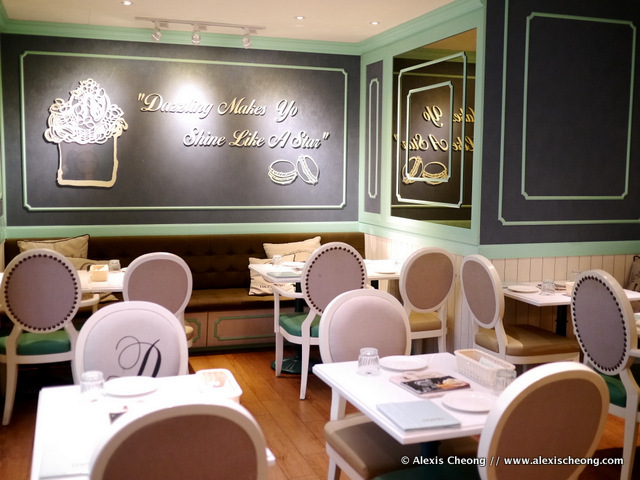 The decor is French-inspired, mint, and lovely. 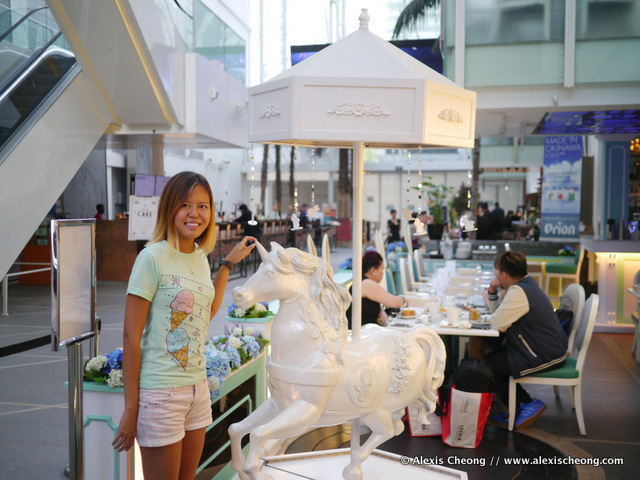 This month, the second branch of Dazzling Cafe is set to open at Orchard Gateway, with a Pink and Black theme around a carnival amusement park. That branch will also be selling accessories so you can shop and eat at the same time, because who doesn't like to multi-task? On to the food itself - I had a late lunch so was pretty full, but still we managed to try 3 desserts in total between the 2 of us petite girls (skipping the savoury food for another time)! First up, I had to try the Original, right? 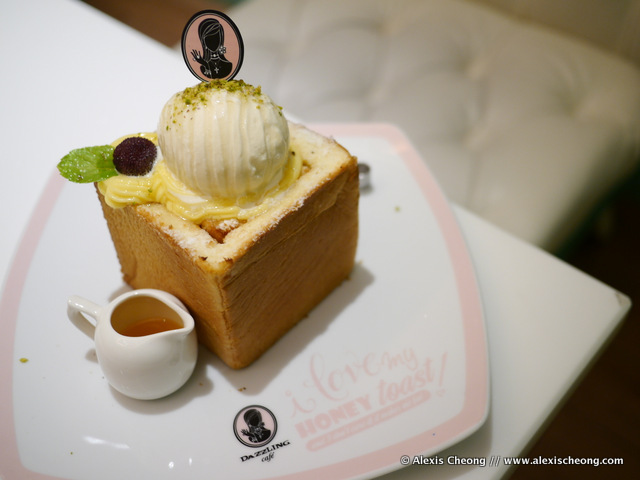 Then, on to Singapore's most popular cafe item - waffles! 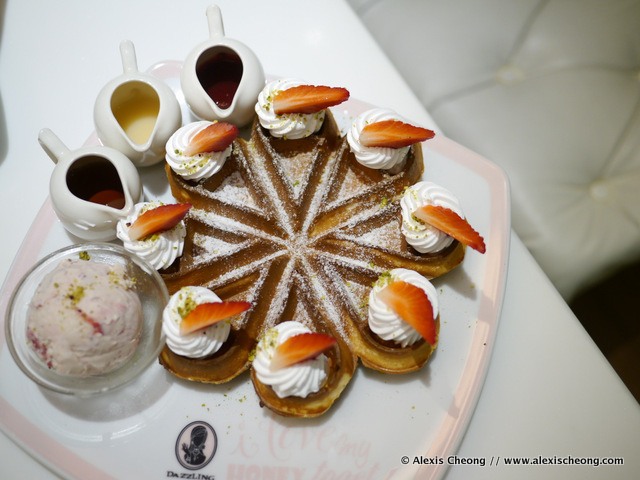 The Strawberry Ice Cream Waffle ($14.90) had extra mochi topping inside for additional $2. The waffle wasn't overcooked or too thick, though I must say that I'd prefer it without whipped cream, as it made it 'wet' when I could have it with the yummy strawberry ice cream. Still, for strawberry lover, this was a must-order! You can view their menu album on their Facebook Page. Prices range from $13.90 for a waffle to $19.90 for their toasts. And that's it! Dazzling Cafe was surprisingly good with their desserts, and memorable spot for some dessert after dinner around City Hall. Go for their simple waffles, or share a toast with 3 or more people. I can't wait to try their food next, and visit their new branch at Orchard Gateway when it opens. Thanks to Dazzling Cafe for the invite!